Turnitin Support have notified us that service access was intermittent starting early this morning. This has been resolved by a fix implemented by their engineers, however as a result they report and we have confirmed that there is currently a backlog of submissions. This means that submissions are taking longer to go through than usual with a reported wait time of 4-5 minutes. This situation should be rectified over the course of the day. Update 20/03/18: If you trigger the class access from a desktop/laptop rather than on the iPad itself via Safari/web browser you are asked to enter your email address (twice for confirmation). Turnitin have made it so that the email you receive includes the full access URL, so in the case where you do not have your university email on your device you can copy and paste the URL in order to add that particular module within the Feedback Studio App. For more details, please refer to the release notes. 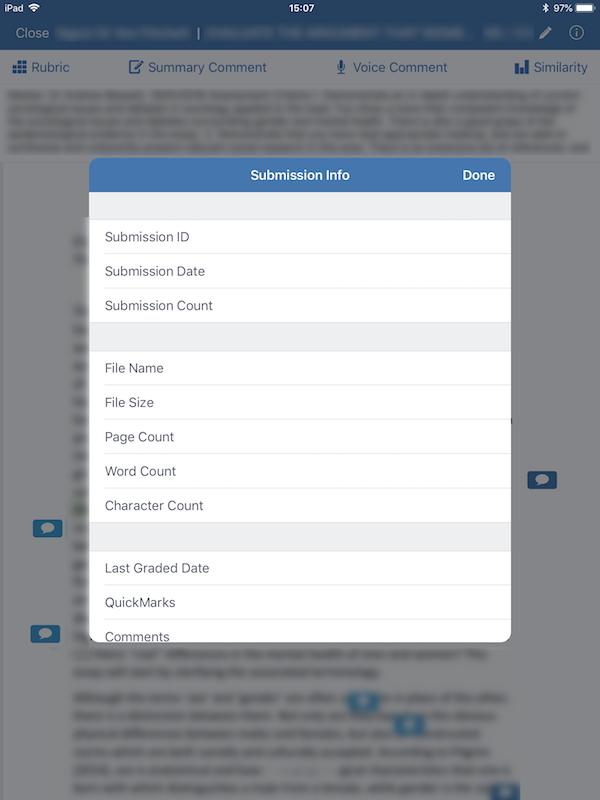 Turnitin released an update for the Feedback Studio for iPad app on Tuesday, 13th of March. This update introduces a key change to the way that you will login to the app, as compared to what we previously recommended at the university. 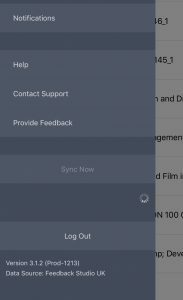 The full notes for this new release of the app can be found at the following link on Turnitin’s site: https://guides.turnitin.com/01_Manuals_and_Guides/Release_Notes/Mobile_Release_Notes . The eLearning team were not given any prior notice of this change to the Feedback Studio for iPad app. Up until now you added submission points to your app using the ‘add-by-code’ method. This option is no longer available. When using the ‘add-by-code’ method we advised that you access Turnitin via a web browser on a desktop or laptop in order to generate the code for the module that you wished to mark. In general, you will no longer need to add submission points on a per-module basis. Make sure that you complete any of your current marking and synchonise the app, prior to updating to this new version (v.3.1.2). 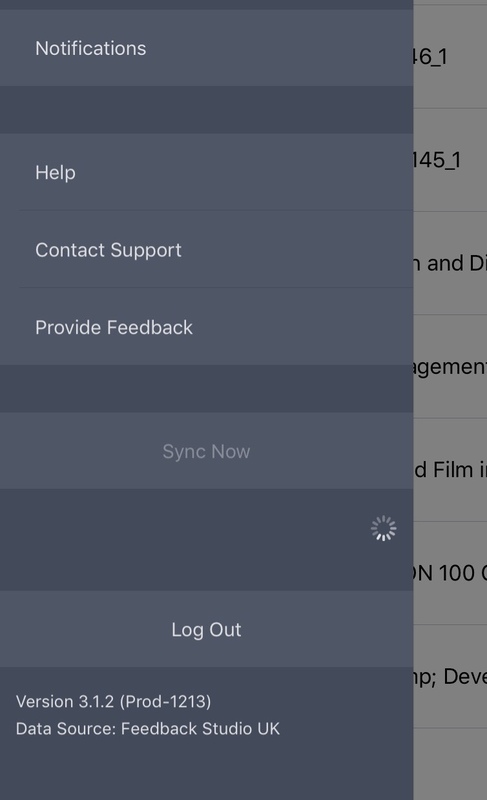 You can force a synchronisation from the app, by pressing the menu icon on the top-left (three lines) and then pressing the ‘Sync Now’ button [SEE screenshot on the right]. If you need to reset your Turnitin-specific password. Please visit this page for further instructions. When you have logged into the app you should find that all the modules that for which you are an instructor are listed on the main page in the app. Q: I’m worried about capacity on my iPad, now all my modules are listed, won’t my iPad be full? A: Although the modules are visible, the submissions are not automatically downloaded to your device unless you actively select them within the app. Therefore your iPad’s storage will not be impacted. Q: I have too many modules listed in the app and I am having trouble finding the relevant ones, is there anything I can do? A: You can remove old modules in bulk using our module removal tool. You can access the tool here (university login credentials required). Q: I am missing the module that I want from my list in the app. A: The best way to add the module is by logging into studentcentral on your iPad via Safari web browser. A PDF flowchart is attached below which will guide you through the steps in this process (it is similar to how you obtained the access code per-module in the past).